The Saturday night Topspiel Dortmund vs Bayer Leverkusen ended with a decisive victory for the Yellow and Blacks, who now have the pole position in the race for the Champions League spot. It was an aggressive start by both sides in which Leverkusen had the first chance of the match in the seventh minute when Lucas Alario was given to much room and managed to break into Dortmund’s penalty box, his shot, however, missed the target. Dortmund had their first chance of the match in the 12th minute. Mario Götze played a fantastic ball to Maximilian Philipp who extended the ball to Jadon Sancho, the English teenager went one-on-one with Ramazan Özcan but failed to get the ball past the keeper. One minute later Sancho was given another chance to score. Left free on the left-wing the attacking midfielder received a wonderful pass from Christian Pulisic went one-on-one once again against Özcan and this time curled the ball past the keeper to open the scoring. Dortmund kept up the pressure Pulisic (14′) received a great ball from Sancho and Bayer defender Benjamin Henrichs blocked the shot at the last minute. Dortmund remained kept up the pressure, and in the 35th minute, Marco Reus scored a fantastic goal, which was later annulled due to VAR. Two minutes later Pulisic was brought down in the penalty box, but Reus had his penalty saved by Özcan. Dortmund were dominant and should have had a decisive lead at halftime, but inconsequential play, VAR and a missed penalty were in the way of additional goals scored by the Yellow and Blacks. Leverkusen pressed higher in the second half allowing Dortmund to counter-attack in their stadium. In the 49th minute, Sancho dribbled through Leverkusen’s defence and spotted Götze whose shot from the right corner of the box was blocked. The situation was not over, however, the ball ended up with Reus outside the box, and his curled effort from an impossible angle hit the crossbar. In the 55th minute, Reus finally had his goal. Julian Weigl played a fantastic ball to Götze; he extended the ball to a streaking Reus, who curved around Özcan to score Dortmund’s second. Dortmund were not done. In the 64th minute Manuel Akanji played a brilliant ball to Sancho, the Englishman was through and spotted Philipp at the centre of the box and played an inch-perfect ball to the striker, who only had to tap the ball across the line. Leverkusen were beaten but did not give up and had their most significant chance in the 74th minute. Kai Havertz was left free in the box and unleashed a low shot, Bürki was quickly down, however, and saved the shot. Instead, Dortmund scored their fourth in the 79th minute. Mahmoud Dahoud played a great ball to Sancho, who lopped the ball to Reus and the Dortmund captain headed the ball home. It was the final highlight of a match that was dominated by Borussia Dortmund. Jadon Sancho has finally arrived in the Bundesliga. Brought in because of Michy Batshuayi’s injury the 18-year-old winger scored the opener for Borussia Dortmund and then assisted on two more goals. The Englishman was a constant threat on the wing and brought an element to a side that resurrected itself after a poor game in the derby against Schalke last weekend. Peter Stöger went all in for the match against Leverkusen. 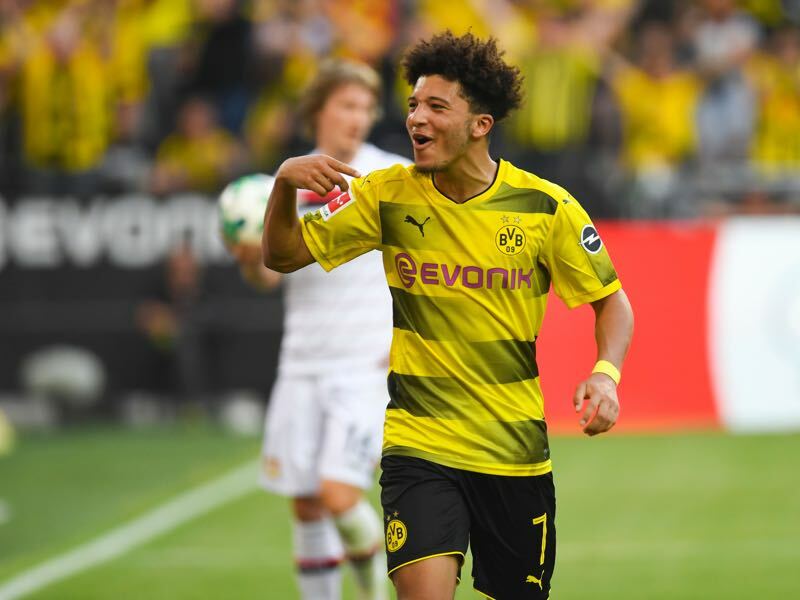 Without the injured Michy Batshuayi Dortmund head coach Stöger opted to start the talented Sancho for Philipp, who took the number 9 position. The head coach also left Marcel Schmelzer out of the squad. The left-back has had a poor season despite wanting to be a leader in the squad and was replaced by Manuel Akanji. Nominally, a centre-back the Swiss defender was fantastic and may replace Schmelzer on the left long-term. Reus scored his 60th goal for BVB in the Bundesliga matching Reinhold Wosab’s goalscoring record – only seven players scored more often for Dortmund. Jadon Sancho is the youngest Englishman to score in Bundesliga history (6601 days old). Lukasz Piszczek is currently unbeaten in 39 consecutive home league games for BVB – the only other player to achieve such a feat for the club was Pierre-Emerick Aubameyang between 2015-2017.